Publishers Archives - ZEDO, Inc.
We’ve been around since before the dot com bust, which gives us the authority to predict the future (just kidding). But one thing we know, because it has been more a reality than a prediction in the past, is that the IAB under Randall Rothenberg is a powerful industry group that can drive change in our industry in the direction it chooses. The last two big changes involved visibility metrics, and verification metrics. Now IAB Tech Lab is moving the industry in the direction of the block chain. The blockchain, a technology that really isn’t new but became prominent when Bitcoin, a cryptocurrency built on its technology, briefly became a “store of value” last year. When we say store of value, we mean people began to invest in Bitcoin the way they invest in gold or the stock market. What are the benefits of blockchain in the media and advertising space? Given the complex nature of the digital advertising supply chain, blockchain technology can offer greater efficiency, reliable and high-quality data. Blockchains can create a more efficient medium by which two or more completely anonymous or semi-anonymous parties can complete various types of transactions potentially at a low cost. Since blockchains are decentralized peer-to-peer networks, there is no single point of failure and no single access point for malicious hackers. Thus, it enhances safety and security for data. This ability to keep a fully verifiable and immutable ledger or database that is available to all members of the blockchain provides a layer of trust and transparency that isn’t always available within media and advertising processes. While blockchain will not cure all of ad tech’s problems, it can be beneficial in situations where there is censorship and both sides of the supply chain (i.e. publisher and advertiser) are disadvantaged by not having access to that information. Members actively involved in the IAB program include FusionSeven, Kochava Labs, Lucidity and MetaX, with each piloting emerging blockchain-based offerings with supply chain partners including advertisers, agencies, DSPs, exchanges, publishers and technology vendors. As an example, IAB said Lucidity’s ‘Layer 2’ infrastructure protocol is being used in a pilot to verify ad impressions and improve programmatic supply chain transparency through a decentralised, shared and unbreakable shared ledger. This will be followed by other pilots looking into fee transparency, digital publisher signatures and audience verification. Another company not involved in the IAB Tech Lab’s group is Brave, creators of the browser that pays publications through its own cryptocurrency, the Brave Attention Token (BAT). There’s almost no way that the blockchain will turn out to be completely useless to advertising, since the entire purpose of Ethereum’s technology was to create smart contracts. However, unless it can scale in speed, you won’t see it in ad tech any time soon to do things like serve up ad calls. After content, context is now king. One of the reasons Facebook and Google advertising have captured so much of the digital ad market is that they, especially Google, are able to target ads according to keywords. AdSense and Facebook use different methodologies, but they’re both known for their precise targeting. They have glaring weaknesses, however, especially as more and more digital advertising is video. With video ads it is still a major problem is that so many ads run without context, even though they may be closely “targeted” to a demographic or a geography. They still run without context, because we don’t quite have the tools yet –nor the will– to provide video context totally programmatically. Especially on YouTube there are many instances where we’re increasingly seeing pre-roll and mid-roll that has nothing to do with what the audience is actually wanting to see. This is not a plea for the old TV practices of selling sweetened cereal to youthful audiences, but a heads up to brands who care about “delighting” rather than alienating their customers. A golden age is coming for contextual advertising, as a result of two things: 1) the realization on the part of brands that they’re threatened by Amazon and other services, and 2) the propensity of younger audiences to require corporations to reveal their values. To encourage brand loyalty, marketers will have to do what they should have been doing all along: buying travel ads on travel sites. sports ads on sports sites. If you throw in the effects of GDPR, as a potential third motivator, we believe it is becoming increasingly important to brands to understand where their ads are appearing, as well as who the publications’s audience is. If I’m looking to fix my truck and I’m about to watch a video about suspension problems, I might be a millennial in the midwest and white, but ads for sports, hot dogs, or video games are merely an interruption. Let me just watch how this guy replaces his front suspension so I can do the same thing to my truck. What if I could see an ad for the right car parts, for local mechanics, or even for new trucks? This is called contextual advertising, and back in the day when more ads were sold direct, as a media buyer I could be sure I was getting that kind of context. As an advertiser, that would give me much greater potential ROI. It would also fix that feeling most consumers have that they’d just as soon skip the irrelevant ad as soon as possible. We’re making an appeal to the digital ad industry to think before buying and selling ads programmatically without context. One of the reasons consumers no longer tolerate advertising its its lack of relevance to the moment they are in. And that doesn’t have to be the case. With all the tools we have at our disposal — artificial intelligence, mounds of first party data, and great programmatic services, there’s no reason why we can’t do better. Both publishers and consumers deserve that. Joshua Topolsky, founder and CEO of “The Outline,” has decided to go against the prevailing trend of paywalls and subscriptions. Because many publications are afraid of what will happen to their advertising dollars as a result of GDPR and the trend toward ad blockers, they’ve all gone like sheep to the subscription model over the past year or so. But we’ve written before in these pages that there is an upper limit on the subscription model, which is bounded by the reader’s time and income. Even wealthy people do not want to spend all their money on subscriptions. What happens when Topolsky goes to the advertising world and tells them “I don’t have big traffic, I have smart traffic” when the usual advertisers are looking for reach? In his opinion, advertisers have realized that what has been sold to them as the magic solution –i.e. big audiences on Facebook and Google–bought programmatically, has now been exposed as less than ideal for a multitude of reasons. While there is still a scale play for people like Buzzfeed, “The Outline” strives to differentiate itself on engagement. As an example, Topolsky says his site gets more views on custom content than sites with four times the amount of traffic. He has also said in the past that his click through rates are 25% higher than the industry standard. “Not every advertiser will advertise with us, but some good ones will. Smart brands who want to speak to audiences directly, like Cadillac and MacAllan like us.” The custom content gets seen and is engaged with partly because it is more visible (there are fewer ads) and because it’s smart. Also Topolsky targets his stories carefully to his audience, mostly urban, mostly Millennial, mostly well off. MacAllan used “The Outline” to tell its brand story for a $300 a bottle scotch. There are only a few million people who will pay that much for a bottle of alcohol, and niche products work for niche sites. Last week’s post, “Advertising isn’t Going Anywhere,” was written a couple of days before Hulu revealed at its NewFront presentation that it was going to allow downloads, and they’d be ad-supported for all of the Hulu users who are on the free plan. My main point was that people can only afford a limited number of subscriptions — far fewer than they’d want. So it’s great for the consumer in several ways that an aggregator like Hulu will have downloading with the ads remaining in the downloads. Hulu has 20 million subscribers, most of whom are on their ad supported plan. Hulu had a lot of updates at its NewFront/Upfront presentation this morning, but among the most interesting for me was that Hulu will offer downloading of its content, but with ads included. Since the vast majority of Hulu’s 20 million+ subscribers are on the ad-supported plan, this means Hulu is going to be breaking some new ground in downloading, relative to its ad-free SVOD peers Netflix and Amazon, both of which have been offering downloading for a while. Hulu has lagged its peers by not enabling downloading, but its new feature, whose specific launch date was only identified as “during the 2018-2019 upfront season,” will differentiate itself immediately by having ads included. As we all know, Netflix and Amazon have sucked an enormous amount of ad-supported viewing hours out of the ecosystem, with downloading on these services becoming a bigger contributor. By including ads, Hulu directly addresses this, allowing advertisers to at last follow viewers into their offline viewing experiences. Hulu’s light load of ads, which are unskippable, only enhances the value proposition to advertisers…. Given the rise of ad-free SVOD, more advertisers will struggle to reach their millennial audience targets with 100% brand safety and viewability, making Hulu a prime option. Hulu has also been very smart about scooping up rights to popular library content to augment its still limited (though rapidly expanding) slate of originals, led of course by “The Handmaid’s Tale” which was renewed for season 3. So if you want to download and view Hulu content, the only way you can do it without ads is to pay for the highest level of subscription, which is Hulu with No Commercials. This is going to create a problem for millennials, who are big Hulu watchers and do not like to sit through ads or pay for subscriptions. I think it’s a safe bet that, unless the ads become terribly onerous, the convenience of being able to watch such a large variety of popular shows on demand will outweigh the indignity of sitting through an ad. This is a recommendation for the ad industry: don’t kill the goose that lays the golden eggs. If this works, we may see other sites introducing ad supported downloads as well. Lately almost every quality publisher is experimenting with paywalls and subscription services. They are now viewed as a panacea against the need to handle consumer data, and a hedge against the increasing use of ad blockers. Of course subscriptions to newspapers and magazines were available back in the days of print, too. So why did print publications also run advertising? One simple reason: subscriptions cannot support most publishers, unless they are in a niche category without a competitor. The Information, a technology business publication aimed at wealthy investors, falls into this category. But most publications do not. Even the Wall Street Journal, the leading financial publication and one that many people WILL pay for, cannot get by on subscription revenue alone. Nor can the leading news sites like the New York Times and the Washington Post support themselves solely by instituting paywalls. Why not? Because the average middle class consumer, who has been reached in the past through advertising, cannot afford to subscribe to everything she needs to read, see, and hear. We live in the Information Age, and very few of us can afford to ignore the need to stay abreast of a very rapidly changing world. She’d like to get the national and world news from a reliable source, so she visits the New York Times. But finding it too biased, she must also often visit the Washington Post. Neither of them covers news from her hometown, so she reads her local news site. And since she’s a homeowner, she reads a lifestyle publication. Or a fashion magazine. Or Consumer Reports. To save money, she cut the cord on cable TV a year ago, so for entertainment she relies on Amazon Prime video and Netflix. But some shows are only on Hulu. Her husband subscribes to ESPN. He’s also a reader of Bloomberg and Wired, and they just instituted paywalls, too. At the end of the year, she and her husband look at their iTunes bill and their credit card bills and realize that they have spent over $2000 on subscriptions to both video and text sites. They blew right through their budget. So they decide to cancel their subscriptions to save money. Eventually they trade off the need for privacy and gravitate to sites where they can get news and entertainment free, just by tolerating a few ads. In the mean time, publications that have instituted paywalls find that they are experiencing a great deal of churn among their subscribers, leading to unpredictable revenue projections. Despite their paywalls, they must also run some, although perhaps not quite as many, ads. And that’s how the great paywall experiment plays itself out. Advertising isn’t going anywhere. 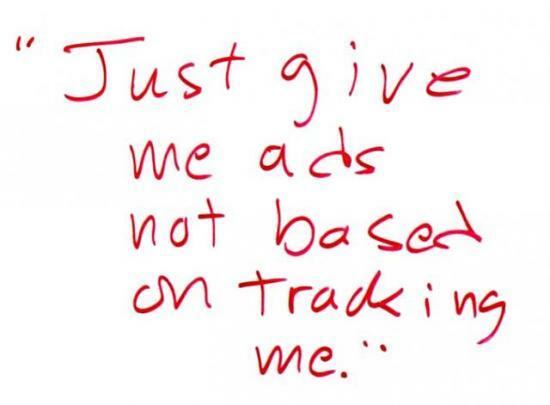 Does Advertising Really Need so Much Tracking? We believe the only cure is code that gives publishers ways to do exactly what readers want, which is not to bare their necks to adtech’s fangs every time they visit a website. That appeared on a whiteboard one day when we were talking about terms readers proffer to publishers. Let’s call it #DoNotByte. Like others of its kind, #DoNotByte will live at Customer Commons, which will do for personal terms what Creative Commons does for personal copyright. Publishers and advertisers can both accept that term, because it’s exactly what advertising has always been in the offline world, as well as in the too-few parts of the online world where advertising sponsors publishers without getting too personal with readers. Madison Avenue also forgot what brands are and how they actually work. After a decade-long trial by a jury that included approximately everybody on Earth with an internet connection, the verdict is in: after a $trillion or more has been spent on adtech, no new brand has been created by adtech; nor has the reputation of an existing brand been enhanced by adtech. Instead adtech does damage to a brand every time it places that brand’s ad next to fake news or on a crappy publisher’s website. Yes, Doc is a friend of ZEDO. But he is also a terrific writer, and you owe it to yourself as a publisher or a member of our ecosystem to read what he has to say in Linux Journal. https://www.zedo.com/wp-content/uploads/2014/12/ZEDO-Logo2.gif 0 0 Roy de Souza https://www.zedo.com/wp-content/uploads/2014/12/ZEDO-Logo2.gif Roy de Souza2018-03-20 16:52:072018-03-16 17:09:02Does Advertising Really Need so Much Tracking?